Say, for example, you want to travel and you love food; but you don’t have the money. The next best thing to travelling is finding the authentic restaurants for whatever country you want to visit but can’t. 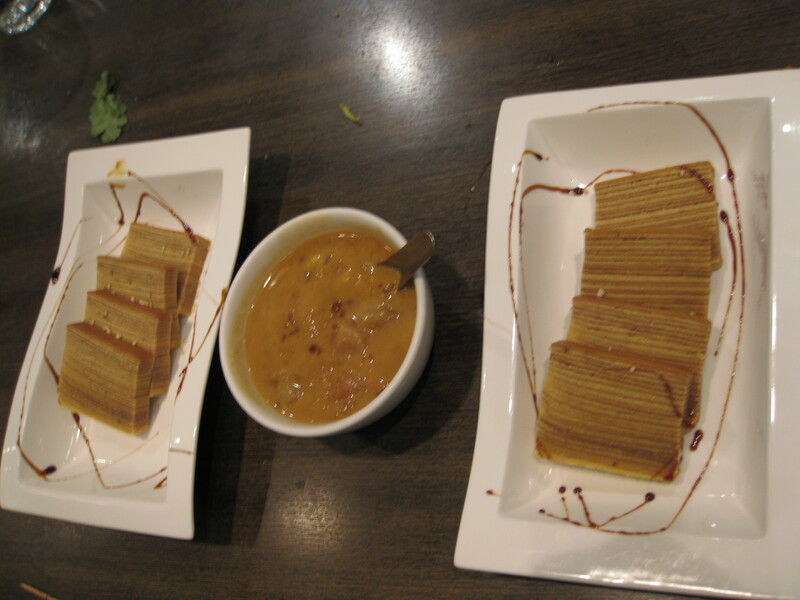 Restoran Malaysia in Richmond Hill serves fantastic Malaysian, Singaporean and Indonesian food. They have a fairly wide selection and they serve halal food. The word Restoran is the Malay word for Restaurant. My friends and I went to Restoran Malaysia during Reading week for lunch. Restoran Malaysia’s food is pretty good, all things considered. My friends and I had the teh tarik ($4), Indonesian nasi goreng ($8), fried kway teow ($7.50), Penang rojak ($10) and bobochacha ($5). 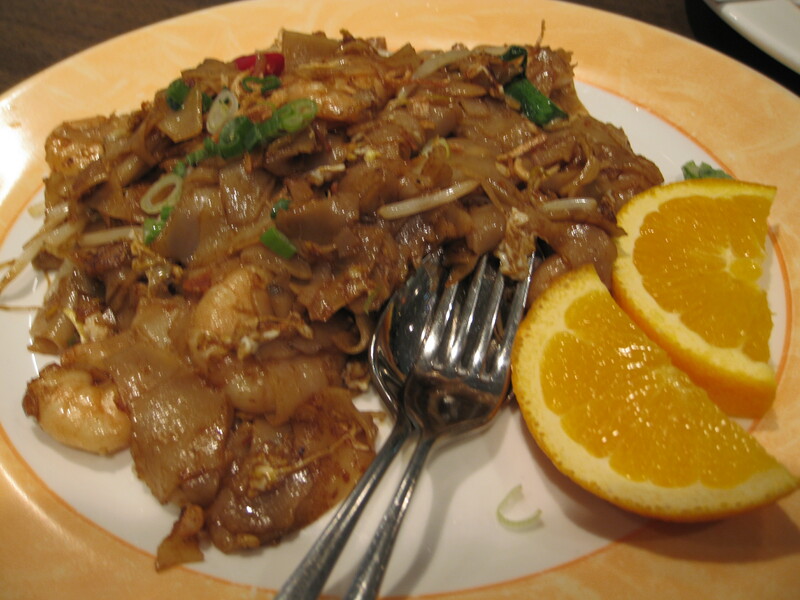 The fried kway teow (or char kuay teow) dish comprises of flat rice noodles, soy sauce, egg, shrimp, bean sprout, chives, and orange garnish. I was slightly disappointed with the fried kway teow (the dish didn’t have the different kinds of noodles or chinese sausage or fish cakes and the colour was too light-the soy sauce should be darker) since I was comparing its authenticity to the fried kway teow in Singapore (against the best of the best in Singapore). 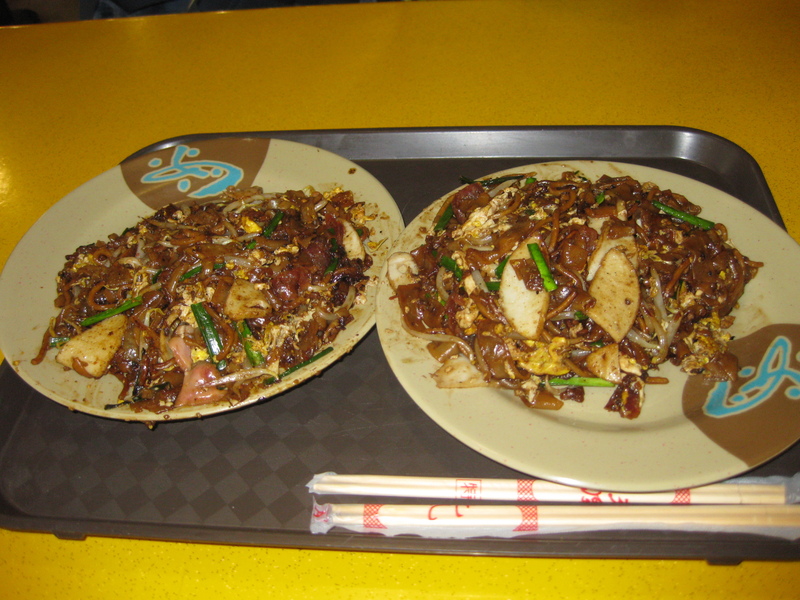 On the whole though, the fried kway teow was good. 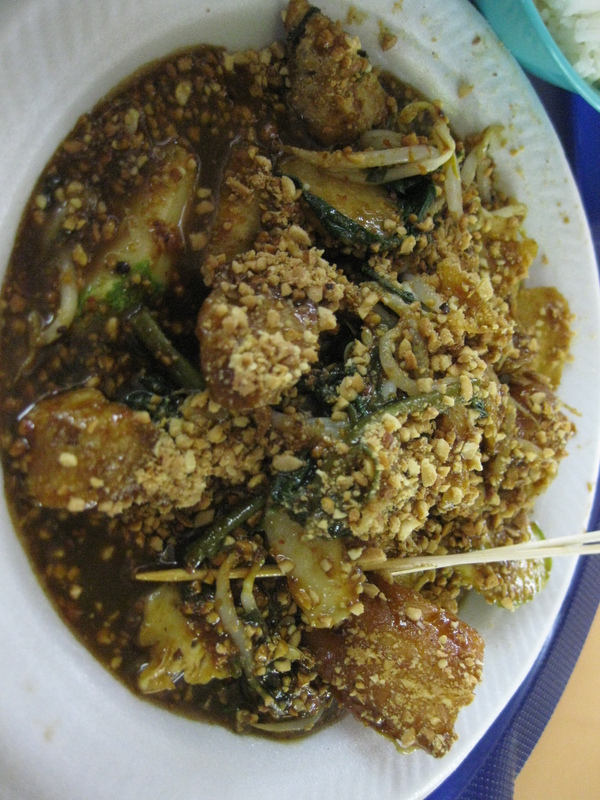 The Penang rojak comprises of fruits, vegetables, and tofu covered in a shrimp paste dressing with crushed toasted peanuts. 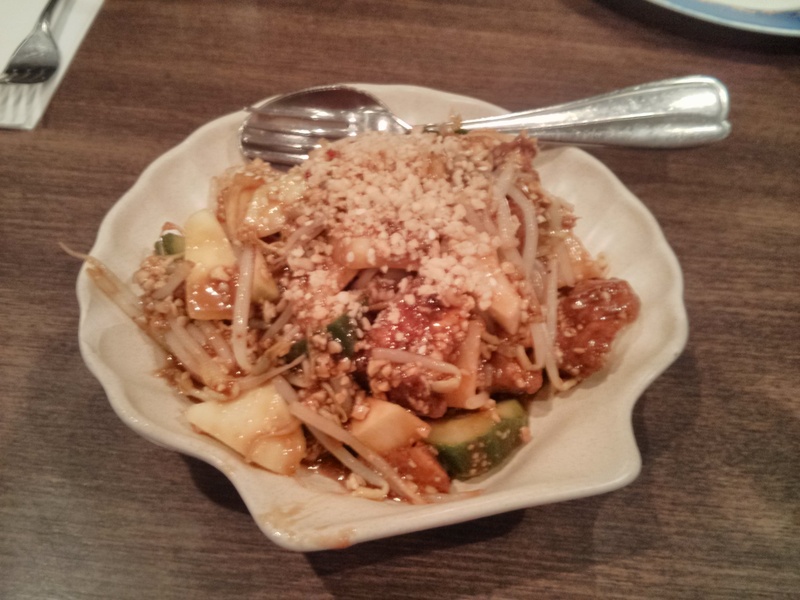 The rojak was great. I preferred if it was slightly spicier but on the whole, it tasted pretty authentic to me. Of course, I only had Singaporean rojak which may be slightly different than Penang rojak since it also has fried dough stick in it. If you have any kind of nut allergy, I don’t recommend this dish for you. 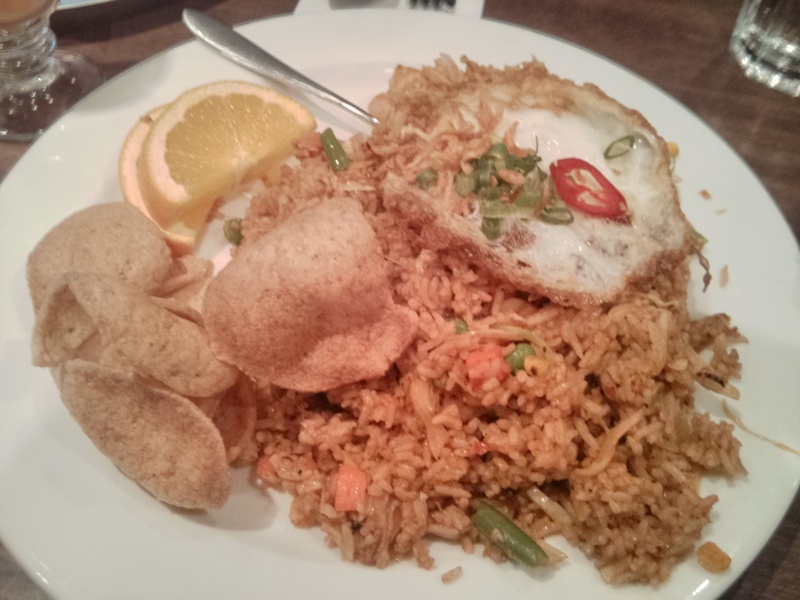 The nasi goreng comprises of fried egg, chicken, shrimp, vegetables, fried rice, shrimp chips and orange garnish. The Indonesian nasi goreng was good although it’s not as spicy as the ones I had in Indonesia. 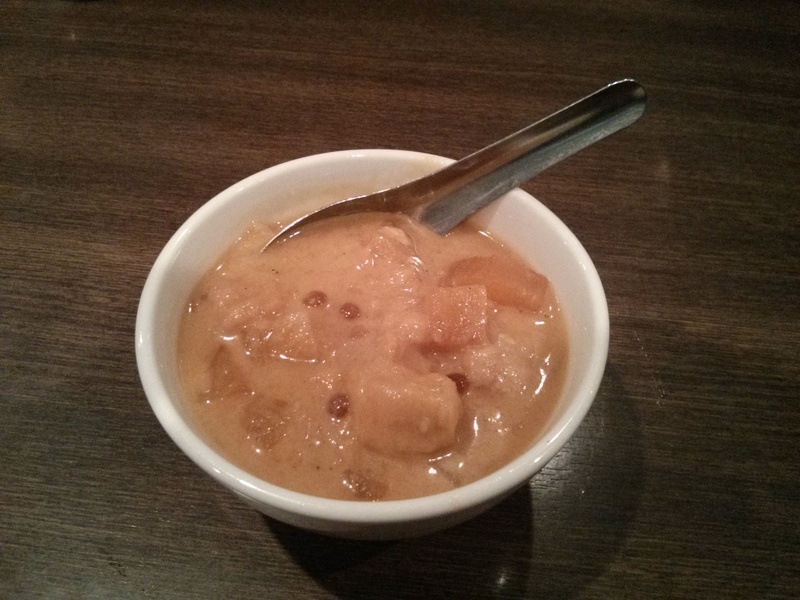 The bobochacha comprises of sweet potato, taro, cassava, sago, coconut milk, palm sugar and pandan. The bobochacha was better than the ones I had in Singapore. Teh tarik literally translates to pulled tea. During the tea preparation, you would transfer the tea between two cups quickly and thus, a “pulling” effect occurs. This pulling effect helps make the tea smooth and quickly cools it. 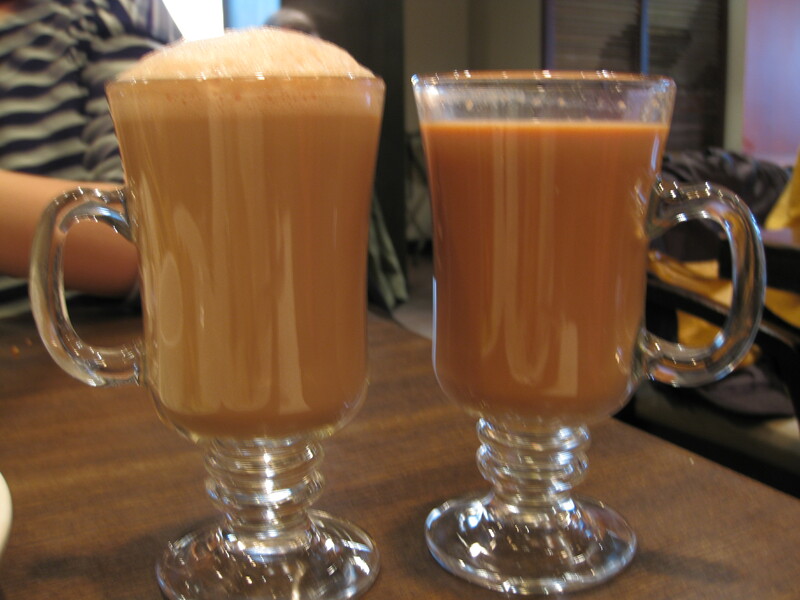 Teh Tarik comprises of black tea, condensed milk and evaporated milk. 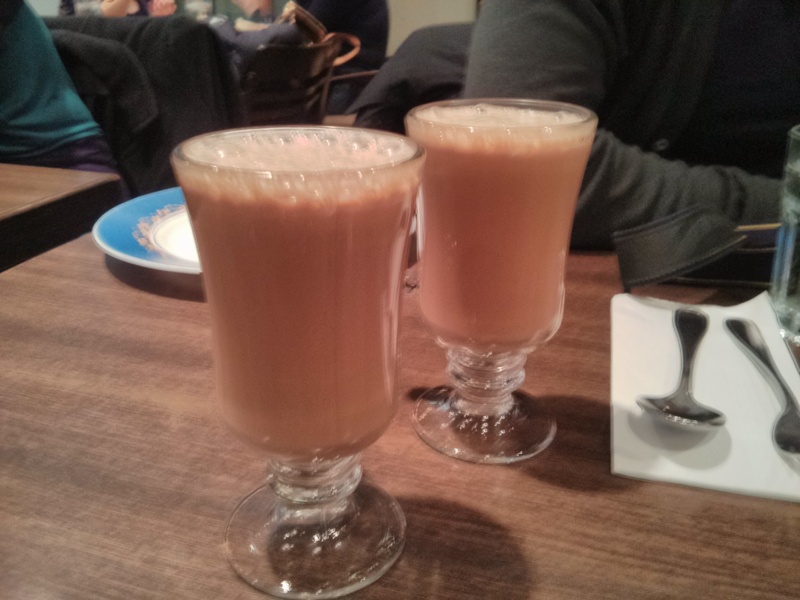 The teh tarik is definitely very authentic and a must-have! I went there again with my friend and her family in April. This time we had satay (mutton ($15), beef ($14), and chicken($12)), fried kway teow ($10), gado-gado ($7), chicken murtabak ($6.50), roti canai/prata with beef curry ($9) and with chicken curry($8.50), mango salad ($8), Singapore laksa($10), teh tarik ($4), teh halia ($5), kek lapis ($5) and bobochacha ($5). 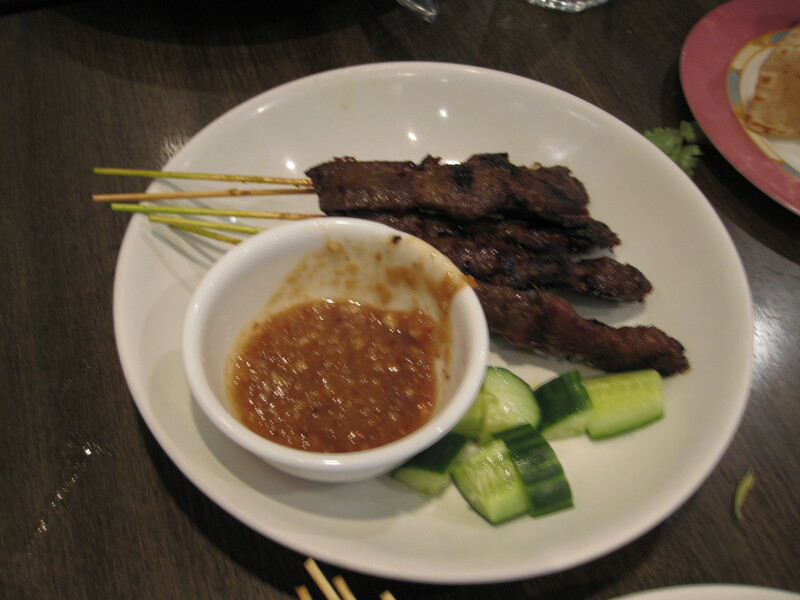 The satay was good. 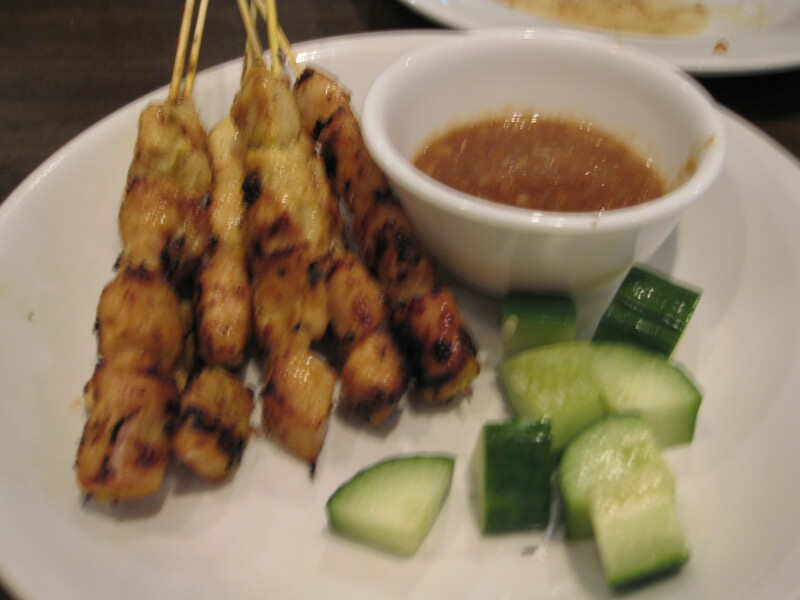 It’s exactly like the satay served in Singapore, with the peanut sauce and the side of cucumbers. I don’t have a preference between mutton, beef or chicken although I did find the beef to be quite chewy. 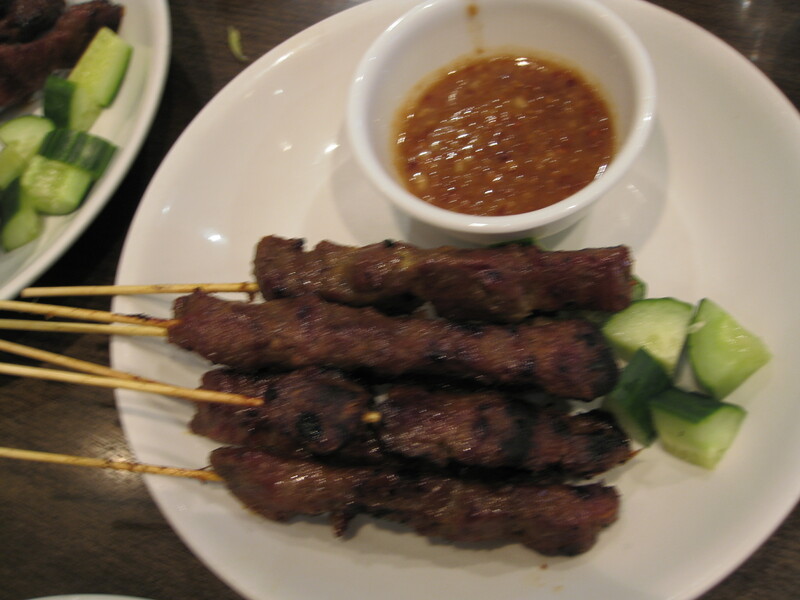 Satay itself is basically BBQ meat on a stick. The gado-gado was slightly spicy but quite delicious. 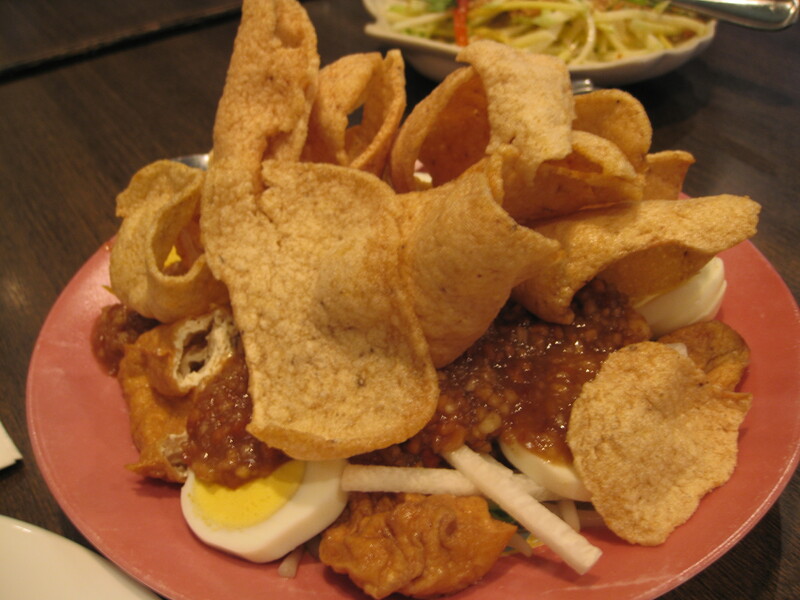 The gado-gado is composed of bean sprouts, cucumber, hard boiled egg, fried tofu, jicama, peanut dressing and shrimp chips. The shrimp chips is slightly different from the shrimp chips that you would find in the dish in South East Asia. The mango salad was ok. 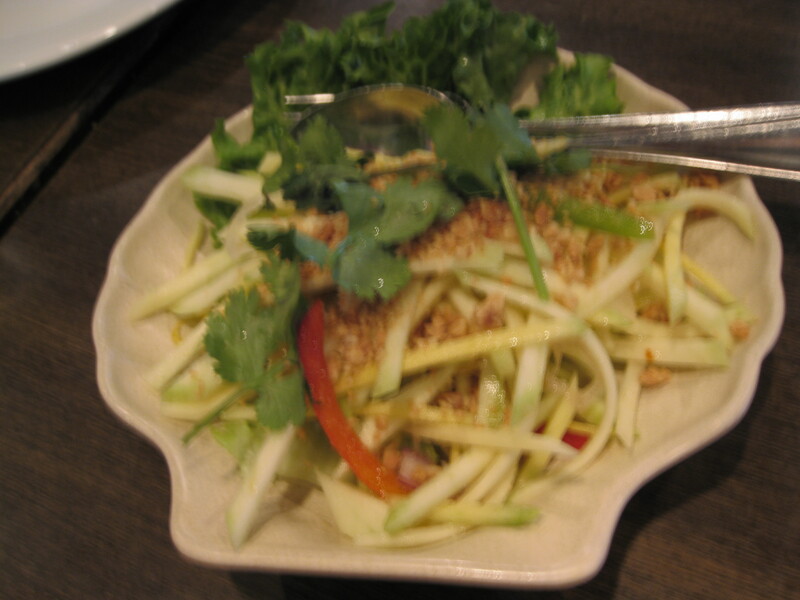 The mango salad has green mango, shallot, sweet pepper, chopped sundried shrimp, toasted peanut and Thai vinaigrette. The chicken murtabak is a stuffed roti and it’s stuffed with chopped chicken, spices, onion and eggs. The chicken murtabak was good. It’s not as authentic as the ones I had in Singapore since the ones served in Singapore come with a large bowl of curry so you can dip the murtabak in it then eat it. The one served at Restoran Malaysia doesn’t come with curry or any kind of sauce. 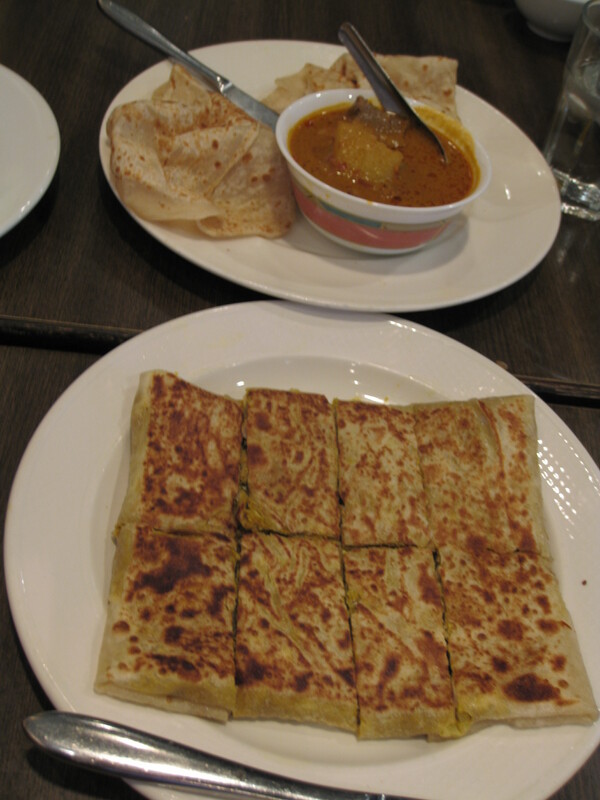 Luckily, we were able to dip the murtabak in the curry sauce for the roti so it became fairly authentic to me. 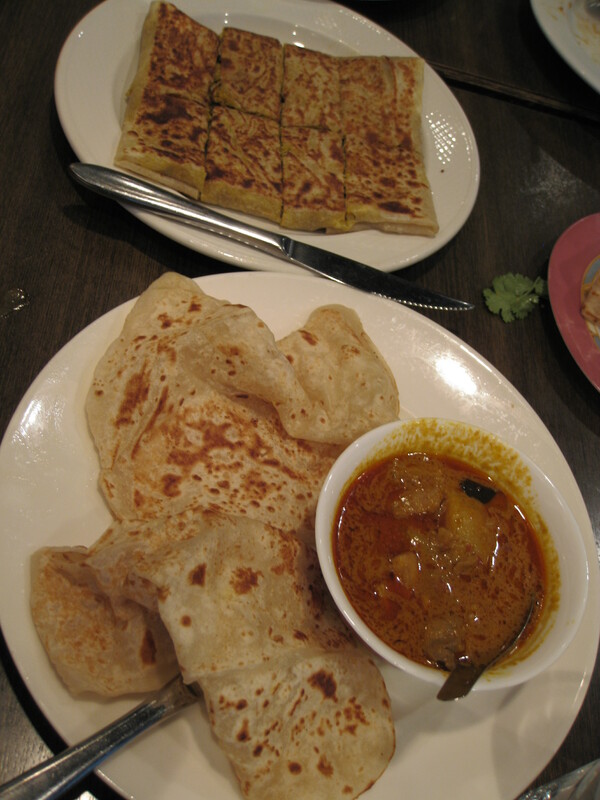 The prata with beef curry and the prata with chicken curry were both good. It was as authentic as the ones I had in Singapore. There were pieces of meat in the curry sauce and the roti was crispy. 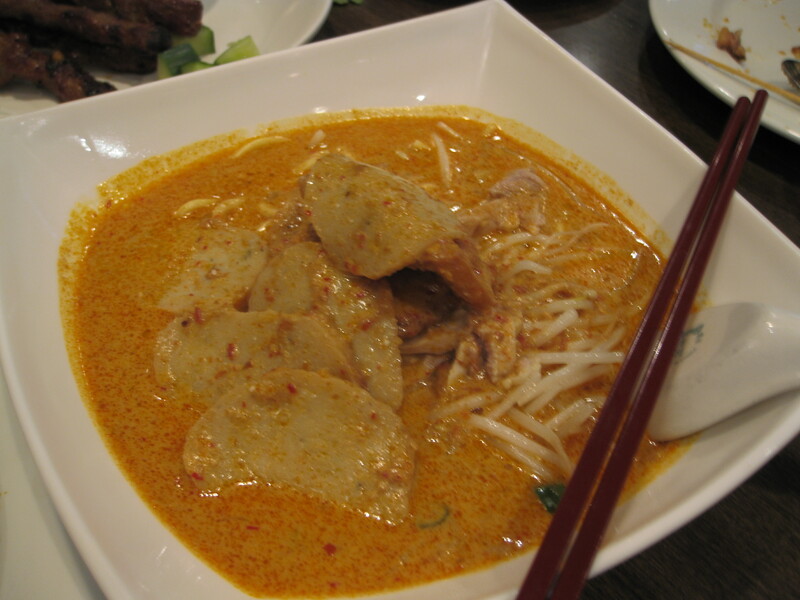 Singapore laksa is comprised of Miki noodles, chicken. 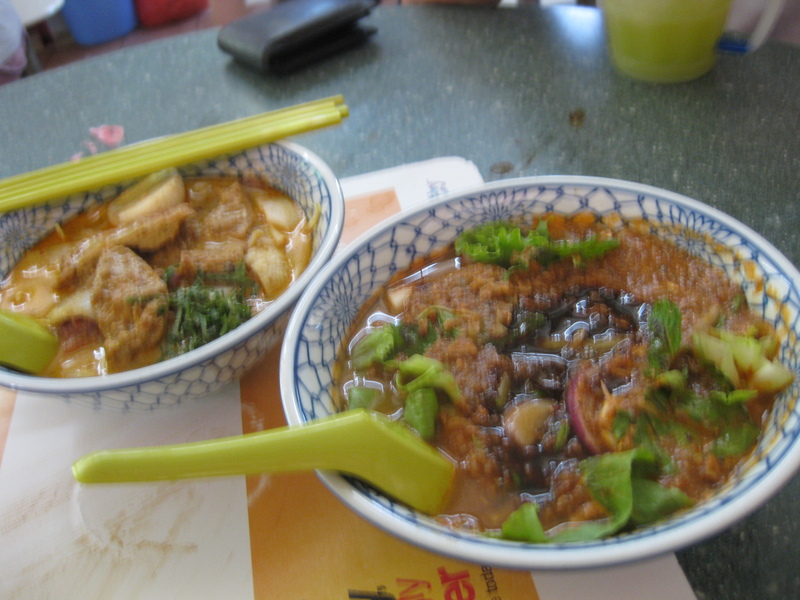 tofu, fish cake and beansprouts in a shrimp based laksa broth. It was enjoyable although it wasn’t as authentic as the ones I had in Singapore. There were more toppings in Singapore and it’s spicier in Singapore. Teh halia means ginger tea in Malay. I had the ginger milk tea. It was just as authentic as the ones I had in Singapore. It had a strong ginger taste and smell. I really enjoyed it. My friend had the teh tarik and she loved it. Kek lapis is spice layered cake. 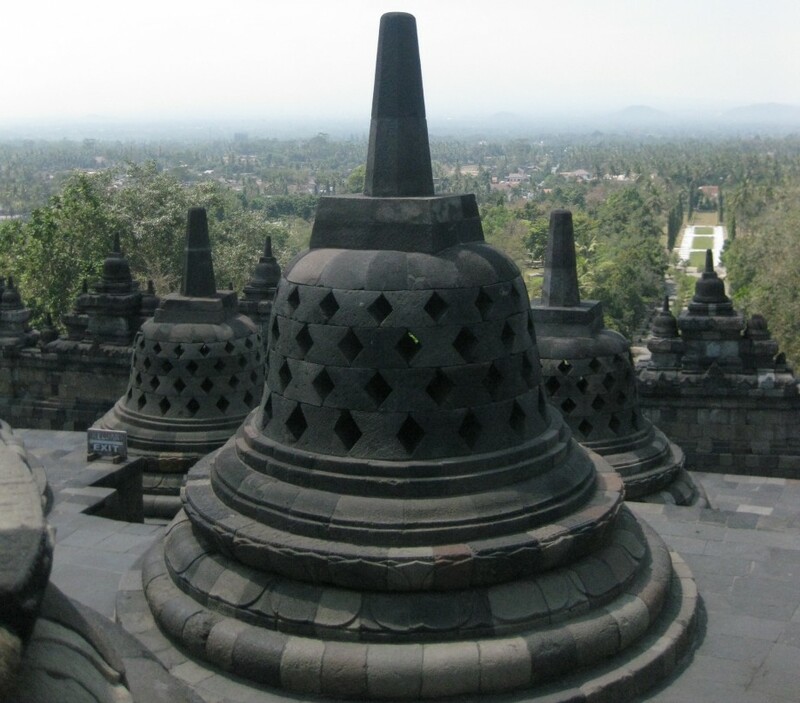 It originates from Indonesia and was brought to Malaysia where it’s served on special occasions. Kek lapis comes in many different colours and patterns. It’s made with butter, flour, eggs, spices, baking powder, caster sugar, vanilla essence and condensed milk. The one at Restoran Malaysia is authentic if on the plain side.